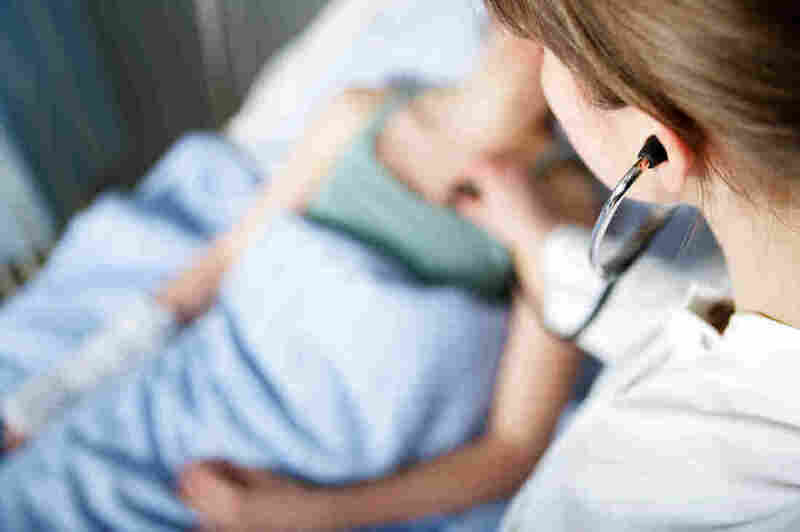 For Doctors-In-Training, A Dose Of Health Policy Helps The Medicine Go Down : Shots - Health News Medical residents at George Washington University go beyond what's ailing patients and spend three weeks examining and diagnosing the nation's health care system. George Washington University is training doctors to understand the health care system as it also teaches them how to take care of patients. A three-week fellowship in health policy for medical residents is run jointly by the George Washington University schools of medicine and public health. In addition to hearing lectures from policy experts in and around the nation's capital, the residents take field trips to Capitol Hill, the Supreme Court, other federal and local health-related agencies, as well as local health care facilities. Dr. Fitzhugh Mullan, a pediatrician and GW professor, has led the program since it began more than a decade ago. When he went to medical school in the 1960s, he says learning how the health system worked was barely an afterthought. "Things such as public health were recognized with a one credit course in the curriculum that everybody thought was terrible, partly because it was and partly because they discounted it as being important," he says. "The notion of engaging with public policy or being concerned with the state of the future of [health care] service delivery in the U.S. was not remotely a part of our training." That's changing, though. On this Tuesday afternoon in early spring, the 20 or so medical residents in the current class are getting a tour of a community health center in Washington run by Unity Health. They stop at the dental clinic, which can accommodate six dentists and a dental hygienist. "If you think that the crisis of medically uninsured is high, the crisis of dental uninsured is even higher," says Andrea Anderson, Unity's medical director. "So many of our patients suffer for not having proper dental insurance." It's not just dental services that gives the health center added value. For example, instead of just telling patients to eat more vegetables, the staff gives out farmers market vouchers and then demonstrates how to cook the veggies patients buy in an on-site kitchen. "So we use the test kitchen to say 'here's how we chop it up, here's how we cook it," she says. "Look, here's your kid chopping it up, having fun." Mullan says medical residency is a particularly good time to teach policy because the newly minted doctors have seen enough of the health system up close to get an idea of where its flaws are. "They're in the game, and the opportunity to stop and talk about the game and how the game could be played better is very appealing to them," he says. That's certainly true for fellow Chris Cahill. He's a third-year pediatric resident at Children's National Health System in Washington. He says he got interested in policy as a medical student at the University of Vermont a few years ago. At the time, the state was debating whether or not to create a new single-payer health care system. That didn't happen. But Cahill says now that he's later in his training, the policy aspects are even more relevant. 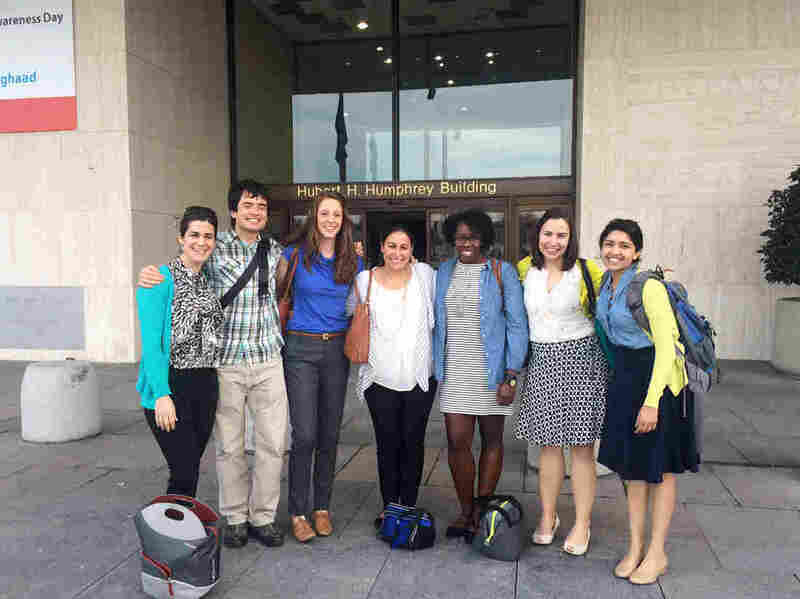 These students are part of a fellowship in health policy run jointly by the George Washington University schools of medicine and public health. In addition to hearing lectures from policy experts, the residents take field trips to Capitol Hill, the Supreme Court and local clinics and community health centers. "It's a great time to do it now because we still have those idealistic ideas, but we also have a lot of practical experience," Cahill says. "We know what the face of these problems looks like much better than we did in medical school or college even." There's a growing awareness that doctors need more training in the nonclinical parts of health care. "You know as a profession we provide the most expensive services that any American will spend money on in their whole lifetime," says Neel Shah, an OB-GYN in Boston and a health policy researcher at Harvard. "And yet at the point of service we can't tell anybody what anything costs. That's crazy." Even worse, says Shah, most doctors are trained explicitly not to take cost into consideration. "Clinical training teaches you to be a terrible steward of health care resources in every way," he says. "When you're being chastised as a trainee, it's always for the things that you didn't do but could have. It's never for the things you did do but didn't have to do. When, of course, patients can be harmed both ways." For now, the program is mostly limited to residents from GW and other Washington-area facilities. But Mullan is in the process of creating a new version for Kaiser-Permanente at three sites in California. Those residents won't have the advantage of being right down the street from the White House and the U.S. Capitol. "But we reasoned that in California there would be state-level issues or city-level issues that had an equal relevance," Mullan says.